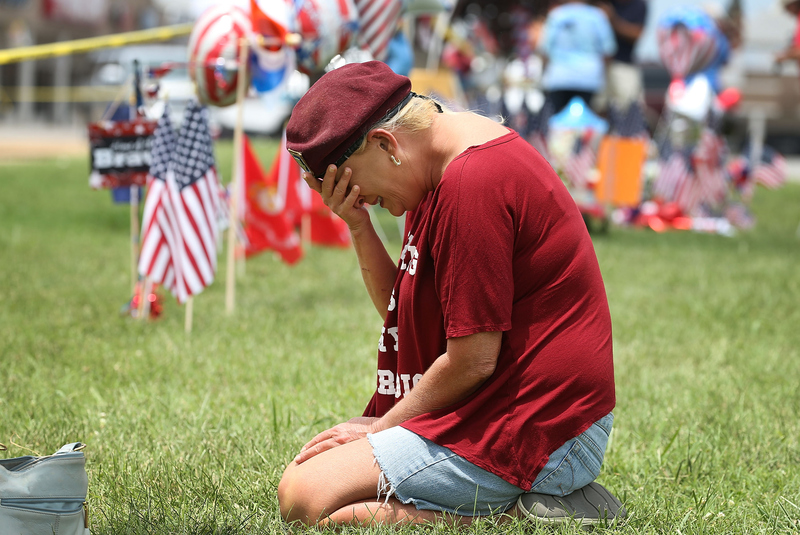 Emotions remained high on Friday following two tragic mass shootings in Chattanooga, Tennessee on Thursday, during which a lone gunman opened fire on two military operation and recruitment centers, killing seven. Four of the victims identified, authorities announced on Thursday, were U.S. Marines. While in-depth profiles of the alleged shooter, Mohammad Youssuf Abdulazeez, painted him as a once-charming, religiously devoted Muslim student, details on the victims, including one Sgt. Carson Holmquist, remain scarce. Initial reports identified the three other Marines killed in Thursday's attack as Reserve Gunnery Sgt. Thomas Sullivan, 40, of the 4th Marine Division; Staff Sgt. David Wyatt, 37; and Lance Cpl. Skip Wells, a former student of Georgia Southern University, which released an official statement Friday upon receiving the news. "The entire Georgia Southern University community is saddened by the news that former student and Marine Skip Wells was killed yesterday in the Chattanooga tragedy along with three fellow Marines," said a university spokesperson. "The Eagle Nation offers our deepest condolences to ... the families of those killed and wounded during this incident." While memories and anecdotes of Sullivan, Wyatt, and Wells have begun to circulate the airwaves, personal details on the fourth Marine, Holmquist, have been harder to pick out. According to a report by Fox affiliate WITI-Milwaukee, the Wisconsin native, whose Facebook page portrayed him as a proud military member and patriot, had already served two tours of duty in Afghanistan. A heartbreaking photo of his wife and son holding up signs that respectively read, "We've waited 244 days for this moment. Welcome home Sgt. Holmquist," and "Welcome home, Daddy" were featured prominently on his page as well, WITI reported. Military records confirmed that Holmquist was an auto maintenance tech who had been located at the Navy operational center the day of the shootings. Few other official details were released. Holmquist's former Grantsburg, Wisconsin high school principal, Josh Watt (who also served as his football coach), told The Star Tribune on Friday that Holmquist had been immensely proud of his role as a Marine, even paying a visit to his old campus once, clad in his formal dress blues. "When he became a Marine he was very proud of that," said Watt. The sentiment was echoed in dedicatory statements regarding the other three Marines as well. The Boston Globe reported on Friday that Sullivan, a resident of Springfield, Massachusetts, had been a well-loved, popular community figure, and an "all-around awesome guy," said former high school classmate and friend Tim Houlihan, in a comment to the paper, calling the two-tour, Purple Heart recipient by his nickname — "Sully." "He was destined to be a Marine," said Houlihan. "It was his calling." 37-year-old Wyatt of Burke, North Carolina, had moved to Chattanooga with his wife and children and, according to neighbors at a Friday morning vigil at his family's home, was "a nice man." "There were seven or eight cars there last night, [but] I thought they were having a party," said one of Wyatt's other neighbors, Antony Madakcherry, in a comment to The Tennessean, remarking on the scores of mourners who had flocked to the home to pay their condolences. "It didn't go through my mind." Lance Cpl. Skip Wells, 21, of Cobb, Georgia, was remembered by loved ones on Friday as a "protector" who had initially surprised his closest friends with his intentions of military service — although Sprayberry High School classmate Lindsey Pittman told The Atlanta Journal-Constitution that the revelation "made sense" once they had considered it. "He looked at everyone with love," said Pittman. "And he would go anywhere to protect anybody." Pittman also told the paper that she and Wells had been fellow "marching band nerds" and that he had been an inspiring leader to his fellow students. "He always spoke the best of everyone," she added. So far, families and friends of all four have been keeping mostly to themselves, in order to process the news. But the grief among all those who knew the four Marines was apparent. In Granstburg, the "tight, close-knit" hometown of 27-year-old Holmquist, news had left community members shell-shocked and trying to understand what had transpired. "[Holmquist] was a great young man — a hardworking young man," recalled Watt to The Star Tribune. "It's a very tough day in Grantsburg."